The Moon Wrasse or Lunar Wrasse is the most popular, peaceful, and readily available wrasse in the Thalassoma genus,...and it is also very reasonably priced! The Moon Wrasse or Lunar Wrasse is very popular and readily identified. All the common names of this wrasse are derived from a description it's tail; Moon Wrasse, Lunar Wrasse, Lunare Wrasse, Crescent Wrasse, and Lyretail Wrasse. This is because as an adult, the yellow caudal fin becomes very 'lunate', which means shaped like a crescent moon with long upper and lower lobes. This fish is often confused with the Yellow Moon Wrasse Thalassoma lutescens, probably due to the cross-over in the common name, but they can quickly be differentiated when compared to each other. This active wrasse is hardy, easy to maintain, and long-lived in the aquarium. Gaining length up to almost 10", it is necessary for the Moon Wrasse or Lunar Wrasse to have plenty of swimming room. It is an excellent fish for the community aquarium as it is a peaceful fish, with only secondary males becoming aggressive. This wrasse doesn't bother corals but it will eat crustaceans and invertebrates. When frightened this fish will hide in the rock work, or may bury itself in the sand. Several Moon Wrasses in a distributor's tank. Seeing a Moon Wrasse (Thalassoma lunare) in a holding tank helps in depicting its beautiful appearance. They are very hard to film, but this one shows their coloring the best! Thalassoma wrasses are very easy to care for and although they are relatively peaceful toward other fish of similar size, they will eat smaller fish. They should be housed in larger tanks with larger fish and really need at least 75 gallons. They can be kept in a carefully appointed reef with species they are compatibly with. They will eat several types of inverts, but they will not bother corals. The Moon Wrasse is quite spectacular as an adult! Growing to almost 10" or more, they require a tank that is 6 feet or longer. While juveniles are well behaved, adults become quite the bullies! They will chase newly introduced fish and will eat or try to eat long thin tank mates. Provide a lid for this agile jumper! The Moon Wrasse or Lunar Wrasse was described by Linnaeus in 1758. Found in the tropical Indo-Pacific oceans; from the Red Sea and East Africa eastward to the Line Islands, northward to southern Japan, and southward to Lord Howe Island and northern New Zealand. They prefer areas where there is clear moving oxygen rich waters in the shallow parts of lagoon and coastal reefs as well as protected outer reefs. They are found at depths down to about 65 feet (1 - 20 meters) swimming in small groups consisting of many initial phase fish (females and juveniles) with one dominant male. 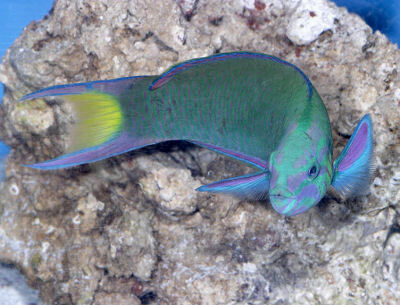 The Moon Wrasse or Lunar Wrasse has a dark green to blue body with soft purple markings on each scale, the head is green to blue with irregular pink to violet stripes, and the pectoral fins have an elongated red spot. This wrasse basically retains the overall essence of its juvenile coloration, though juveniles have a dark spot on their caudal and mid dorsal fins while adults can be recognized by the large yellow crescent on their caudal fin. Secondary males will have the most striking colors. The Thalassoma wrasses are known to be hardy and long lived in the aquarium. Adults can reach up to about 10 inches (25 cm), though in captivity most Thalassoma wrasses only grow to about 6 or 7 inches (15 - 18 cm). These fish are very easy to keep and eat whatever food you may have for them. They adjust very quickly to aquarium life and prepared foods. Hardy beginner fish for a large aquarium. Generally not considered totally reef safe. Though they will not bother your corals they will eat your small crustaceans and invertebrates. Good for a community aquarium, usually peaceful though secondary males can become aggressive. The Moon Wrasses or Lunar Wrasses are carnivorous, in the wild they eat benthic invertebrates, especially crustaceans such as crabs, shells, and shrimp. They also eat fish eggs and snail eggs. Having very hearty appetites, they are easily trained to eat prepared foods in the aquarium. Feed a varied protein diet strong in small crustacea, formulas and frozen foods such as mysis and brineshrimp, and thawed chopped raw fish, and even flake foods. They are heavy eaters that will eat anything and need to be fed 2 or 3 times a day. Normal water changes at 10% biweekly or 20% monthly. This fish needs to have a large aquarium with lots of space for swimming, a sandy substrate and, lots of rockwork for hiding and sleeping. A minimum 75 gallon (284 liters) or larger with a longer tank instead of a tall. A male and female may be housed together as long as the tank is 125 gallons or more. No special requirements but does enjoy patches of sunlight. No special requirements. Normal temperatures for marine fish is between 74° and 79° F (23 - 26° C). Some strong currents and some normal areas, like the ocean provides. They will spend time in all parts of the aquarium. They may be kept as a pair if the aquarium is 125 gallons or more. They are one of the more peaceful wrasses in the Thalassoma genus and can be kept with a variety of other fish without any problems. Secondary males (females that change into males), however can become aggressive and will need to be kept with aggressive similar sized or larger fish. Secondary or terminal males have the most intense coloring. Not yet bred in captivity. In their natural habitat they are known to do group type spawning. The Moon Wrasse or Lunar Wrasse is readily available and inexpensive, ranging in price between about $20.00 to $30.00 USD. I have a wrasse that I have been trying to figure out what species he is. He is most similar looking to the moon wrasse described here except his redish green coloration extends all the way down his rounded tail. He is also about 4-5 inches long. Either way he has been extremely peacefull, hardy and I've had him for quite some time. My only gripe about him is when I feed my corals he is very smart and likes to eat the food out of them. He will eat so much that his belly will get big and round lol. I keep him with a leapard wrasse, percula, bangai cardinal, longspine urchin, regal tang, yellow tang, bicolor blenny, fire shrimp hermit crabs and various snails. I've never seen him pester any of the other fish and my tank doesn't have anyone that does really. So I figured out he is most likely an ornate wrasse. I found a book with a picture just like him and that's what they called it!! Can I add a Lyre Tail wrasse if I have a shrimp in the tank? My Lunar wrasse lives in a 75 gallon soft coral tank by himself. He killed my flame angel, my HumaHuma Trigger, a Dwarf Lion fish, 2 percula clowns and 5 damsels. He will devour anything I put in the tank, and is currently trying to figure out how to eat my urchin. I have came to the conclusion that my tank is for him only and he loves to eat large turbo snails. Sounds like he shold be a loner. Not a friendly fella at all. I just got my Lunar wrasse a few weeks ago and last night he ate my little clown fish. Apparently you have to feed them minimum 2 times a day, which I did not know since I have only had clowns, tangs, and they eat once every two days. If Lunars get hungry, they go after whatever is there. Maybe he needs more food...? My husband and I purchased a lunare wrasse a couple of days ago. This morning my puffer fish was found floating at the top of the tank with a hole in its tummy, I know that it is poison to other fish if they bite it but all my other fish seem to be fine I am not sure if my wrasse is the culprit or not, I have a 50gl tank with a tomato clown (the wrasse has nipped at his fins) two striped clowns , a yellow tang and a coral beauty. they all seem to be getting along ok. they go back in forth on the agression thing so I think they are just playing. I am worried that my wrasse may harm my other fish but I am not sure. Do I have good compatibility? Just get rid of the thing ,sure, the're a great looking fish but these things will try to bite your hand off and if you want your tank to flourish then it may be time to say goodbye mr wrass - think about your other fish! You have too many fish in a tank like that the wrasse is mean I have one I had to get rid of my clown to keep him but my puffer seems to be fine. How big was your puffer you don't have the best compatibility.